Get expert advice on scaffolding accident compensation with a free, no obligation consultation. Designed to be a temporary structure, scaffolding allows workers to reach the heights they need to while constructing new buildings or repairing existing structures. When erected and used properly, within the recommended guidelines, scaffolding offers construction workers a safer and more efficient alternative to ladders when working at great heights. Working at heights itself poses obvious dangers and working on scaffolding adds another element of risk to construction work, especially when the safety regulations are overlooked. These dangers are not restricted to construction workers only. When precautionary measures are ignored, anybody passing by, under or close to the scaffolding could also be at risk from tools or other pieces of building equipment falling from the structure. One tiny mistake when constructing the scaffolding can compromise the integrity of the entire scaffolding. All it takes is a wrong sized bolt or a damaged bolt in one corner for a floorboard to flip or for that section to become unsteady and eventually, the complete structure to collapse. The smallest error at that height can have serious consequences for the workers atop the scaffolding as well as those below. Knowing the dangers involved, most contractors take great care to ensure that there are no lapses. However, despite all precautions, mistakes can and do happen which can result in serious injury and unfortunately in some cases death. Injuries that are caused due to scaffolding accidents can vary tremendously, from bruises and lacerations to fractures, head and brain injuries or even fatalities. Any of these injuries could result from unprotected sharp edges, falling objects, falling from the scaffolding or scaffolding collapse. After a spate of scaffolding accidents and fatalities, several measures have been put in place to ensure the safety of construction workers across the UK. The ‘Work at Height’ regulation states that any work that is being done at height should be properly evaluated in terms of resources required, risks involved and skill/training requirements of the staff involved. The ‘Provision and Use of Work Equipment’ regulations lays out a firm set of instructions on using the various equipment in the workplace and emphasises that all equipment should only be used by employees who are trained to do so. According to the ‘Personal Protective Equipment At Work’ regulation, employers must ensure that all equipment used on the job is fit for the purpose and that all equipment is in good working order before use and properly maintained and stored when not in use. All equipment should also be accompanied by a correct usage manual. The main purpose of all of these regulations is to ensure that all workers are provided appropriate and sufficient protection when doing jobs that involve a high risk of injury. If you are a worker at a construction site and the accident was caused because one or more than one of these rules were not being followed, then your employer may be held accountable. If you are not a construction worker but your injury was a result of an object falling from scaffolding at a construction site, you may be able to file a claim for compensation against the site contractor or supervisor. 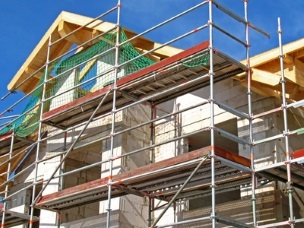 To file a successful scaffolding accident claim, you must first prove that your injury was caused as a result of negligence by a third party. This can be quite complicated and long drawn as all site contractors have their own legal teams that will look for ways to counter your claim. Seeking legal advice from an experienced solicitor will give you the best possible chance of filing a successful claim and winning the compensation you deserve for your injuries and the resultant pain, inconvenience and financial loss stemming from these injuries.